Power(s) given Expands like a balloon, and flies upwards temporarily. Blimp Yoshi is one of Yoshi's power-ups in Super Mario Galaxy 2, along with Dash Yoshi and Bulb Yoshi. 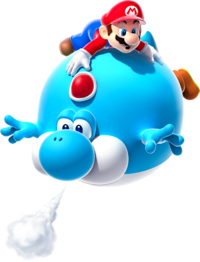 When Yoshi eats a Blimp Fruit, he turns light blue and expands like a balloon. In this state, Yoshi can float upwards for a brief period of time. Blimp Yoshi has a small meter which tells how long his powers will last, similar to that of Bee Mario, but the meter does not stop when Blimp Yoshi stops, unlike Bee Mario. Blimp Yoshi has very limited actions in comparison to Dash Yoshi or Bulb Yoshi; Blimp Yoshi cannot open his mouth to eat enemies or items, but can eat fruit if Blimp Yoshi floats over and touches them. By doing this, Blimp Yoshi can refill his flight meter. He can't use Launch Stars, enter pipes, or Flutter Jump. When floating, Blimp Yoshi can float without moving up if the button is held, but this will not affect the meter and it will continue to run out, but at a slower rate. If the Wii Remote is shaken, Yoshi will return to his normal form. Even though Blimp Yoshi is blowing air out of his body, his size remains the same. This page was last edited on April 8, 2019, at 01:46.